Love your concrete floors? RBC can keep them good as new! Your custom concrete stained floors don’t have to be temporary. In fact, unlike other types of floors, our polished concrete floors have the unique opportunity to improve with age. You can keep your building looking its best, protect your floors and protect your investment with Riverbed Concrete’s tailored care and maintenance programs. 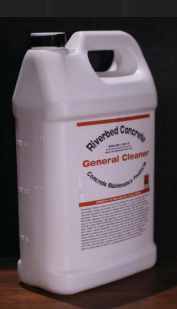 Concrete floor maintenance is easy with Riverbed Concrete’s General Clean Maintenance Program. Based on your building’s needs, you can enjoy weekly or monthly professional cleanings to keep your concrete floors shining like new. Riverbed Concrete’s exclusive tools and services were designed specifically to cleanse and maintain your commercial concrete floors. Join our General Clean Maintenance Program today to extend the life, appearance and strength of your stained concrete floors. Each and every Riverbed Concrete product was designed with your floors in mind. Because we create concrete flooring, we understand the best products and treatments to maintain its beauty. Whether you need general maintenance or floor rejuvenation services, we have the safe and high-quality products to get the job done. Our all-purpose concrete floor cleaner was created using a neutral formula to reduce unwanted residue and rinse with ease. You won’t find a better product to maintain your concrete flooring. Looking for the perfect floor conditioner to maintain the original gloss and shine of your concrete floors? Our concrete conditioner was created with a custom chemical densifier that fills the pores of the concrete, reinforces the structure of your concrete and helps maintain its allure. In certain businesses, like food or auto maintenance, oil and grease may spill or leak onto your concrete floors. Our Poultice Paste is famous for lifting grease and oil out of concrete surfaces with ease. 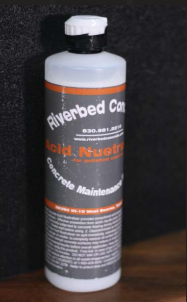 If you work with acidic liquids, you need Riverbed Concrete’s Acid Neutralizer! Our neutral pH floor cleaner was formulated specifically for your concrete floors and will protect your concrete surfaces from acidic liquids. Q: How often does my Riverbed decorative concrete need to be mopped? How do I clean my sealed concrete floors? A: You should dry mop based on the amount of traffic you get. We suggest every day of operation. Wet mop once a week using Riverbed Concrete’s General Cleaner. Q: What should I do if I get a stain on my decorative concrete flooring? 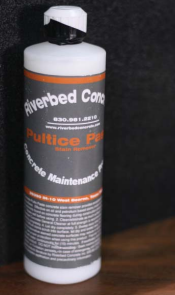 A: For oil staining, we recommend doing a spot cleaning using Riverbed Concrete’s Poultice Paste. Remove any excess dirt or oil before applying the paste. For acid spills such as uric acid, acidic liquids such as juices and wine, harsh cleaners, high pH cleaners and vinegar products, we recommend using Riverbed Concrete’s Acid Neutralizer to clean the spill immediately. Q: My concrete has started to lose shine. How can I regain the shine? A: With polished concrete, a deep clean may be enough to help rejuvenate the shine. 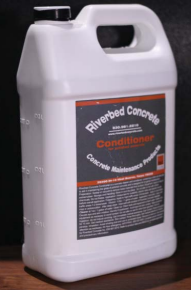 If needed, you may also apply our Riverbed Concrete Conditioner. For sealed concrete floors, use Riverbed Concrete’s Floor Finish to restore the shine and also add a layer of protection. Q: Are these products exclusively for Riverbed Concrete installed floors? A: Riverbed Concrete maintenance products are designed to work with all kinds of concrete flooring! If your concrete floors were installed by a different company we still strongly believe that our products can improve the quality and look of your concrete floors.